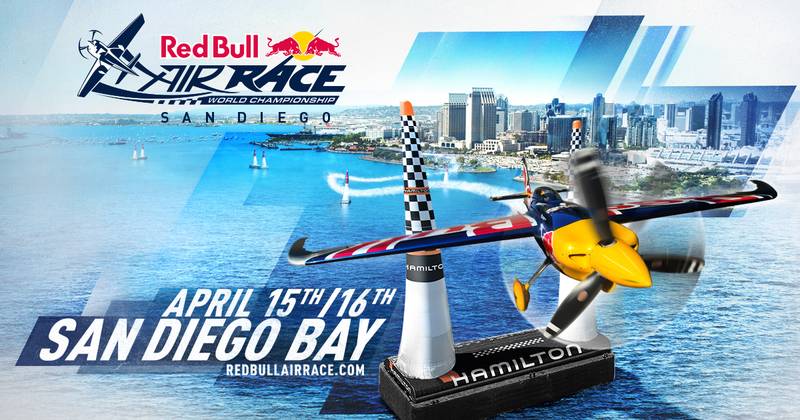 The Red Bull Air Race World Championship makes its return to San Diego on April 15-16. Set on the Pacific coast of California, the location provides the perfect backdrop for the race. San Diego last hosted a Red Bull Air Race back in 2009 and it proved to be extremely popular with the fans that have often asked when the Air Race would return. Well, 2017 is the answer. The Red Bull Air Race World Championships feature the world’s best pilots in a pure motorsport competition that combines speed, precision, and skill. It uses the fastest, most agile, and lightweight racing places with pilots that have to navigate a low-level aerial track made up of air-filled pylons 82 feet high at speeds of up to 230 mph. The track for the San Diego stop will be set up directly over the water in San Diego Bay. Spectators can take in the high-speed action from the North or South Embarcadero Marina Parks. The parks run along the San Diego harbor on the east side of San Diego Bay. The Embarcadero is also home to the San Diego cruise ship terminal, nine historic vessels belonging to the San Diego Maritime Museum, and Seaport Village. The complete field of 14 Master Class pilots competing in San Diego includes two Americans: Kirby Chambliss, who won the world title in 2004 and 2006, and Michael Goulian, alongside the rest of the world’s best when it comes to this unique motorsport sport. The eight-race 2017 schedule kicks off with the season opener this month in the United Arab Emirates, and will also take to the skies in Japan, Hungary, Portugal, Russia, and Germany, before heading back to USA to crown the champion at the Indianapolis Motor Speedway. This will be Red Bull Air Race’s fourth visit to the Californian city since the start of the race. San Diego, a popular stop, drew a crowd of over 50,000 people during it’s three consecutive years beginning in 2007. Tickets for the 2017 Red Bull Air Race World Championship’s are now on sale. A wide range of tickets, from general admission to Aviator Club and premier-level Sky Lounge, are available starting at $20.